Universal Studio Singapore: Universal Studio Singapore Here We Come ! 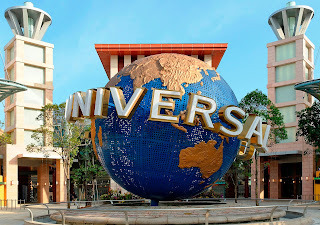 Universal Studios Singapore opened its doors to the public on 18 March, 2010. 1) Tuesdays and Wednesdays are the best if you want a breezier time getting around the park and if you think the express passes are a rip-off. Traffic is at the lowest on these days. Jostling in the crowd during the weekends can be unnerving. 2) Some rides attract overwhelmingly long queues. If you have no patience for that or feel time is against you, pay extra for the express pass, which can be a great perk. 3) With an express pass, one day is more than enough to conquer the entire park. 4) A general guide: Do the rides in the morning as the sun can be blistering hot. Cover the indoor shows in the afternoon. 5) Check out the timings for the shows. You don't want to miss the "live" water show at the WaterWorld and the sole attraction at New York - Lights, Camera, Action! Hosted by Steven Spielberg. 6) The brave hearted are challenged to the most turbulent roller coaster ride at Battlestar Galactica (Red Track), while the not-so-faint-hearted ones will be thrilled to discover the Enchanted Airways and Canopy Flyer. 7) If you little ones can't take on any fast rides, these charming and gentle rides are highly recommended: Madagascar: A Crate Adventure, King Julien's Beach Party Go-Around, Magic Potion Spin, Treasure Hunters, and Dino-Soarin. Don't be too surprised if you still find them on cloud nine after being on the same ride for the fourth time. 8) Water points are not difficult to find but if you want a nice free refill of your bottle with icy cold water, do it at the fast food restaurant, Goldilocks. 9) Pit stops for quick snacks and fast foods are everywhere. If you crave for local dishes, then head for the Discovery Food Centre. 10) Be prepared to get wet at these two stops: Jurassic Park Rapids Adventure and WaterWorld "Live" Water Show. Ponchos are sold at S$2 each. So if you can get cheaper ones, bring them along. Prepare a change of clothes for the little ones if you so desire. 12) Shopaholics, shopping extravaganzas await you at the numerous stores offering Universal Studios themed collectibles, star characters souvenirs, memorabilia and keepsakes. 13) Close the day with a big bang and splash of colours - fireworks at 9pm.